Origin and Habitat: Grusonia parishii is found in the United States, within the Mojave and Sonoran Deserts of southeastern California, northwestern and southern Arizona, and southern Nevada. The range is disjunct with the subpopulations in Nevada and California being well-separated from the Arizona subpopulations. Altitude range: 900 to 1,200 metres above sea level. Corynopuntia stanlyi var. parishii (Orcutt) Backeb. Description: Grusonia parishii (Corynopuntia parishii), is a low, much branched plant, that grows in spreading mats or clumps along the sandy ground. The stems are short, 10-20 centimeters tall, produce roots along the undersides, and grow outward from the initial point to form broad clusters and mats up to 2 (or more) metres in diameter. The segments are up to 9 cm long by 3 wide and surfaced in fleshy tubercles hidden under a dense armament of angled, strongly flattened spines each up to 5 centimeters in length. Young spines are red or pinkish, but soon becoming grey and finally white, blending remarkably with the short, dry desert grass in natural camouflage. The flower is pale lemon-yellow, fading to salmon and the fruit is yellow and up to 8 centimeters long. A characteristic plant that could not be mistaken for any other species in the region. Stems: 10-20 cm in series of usually 1-2 stem segments, from fibrous roots. Segments more or less obovoid, gradually narrowed basally and club shaped, basal to terminal about 5-9 cm, 2-3 cm diameter. Tubercles separate,12-25 mm long, 3-8 mm high wide, 4-6 times longer than wide. Areoles: Round, c.5 mm in diameter, with grey to white wool. Glochids yellow, 5-8 mm long. Spines: 14-22, woody, mostly borne on upper areoles or uniformly distributed over entire segment, grey to brown, with yellowish tips. Largest apical spines about 5, diverging, somewhat round, angular and flattened basally,, to 42 mm long. Central spine brown or white, long tapered. Main basal spines 5-6, whitish to pinkish to tan, strongly bent backward, flattened, 25-45(-58) mm long margin white, thick, sheath separating only at tip. Flowers: Inner perianth 1.5-2.5 cm long, pale yellow with narrow reddish midribs, 1.5-2.2 cm long. Filaments pinkish or green. Style whitish to pale yellow or dull pinkish; stigma lobes white, greenish white or pale yellow. Blooming season: Late spring-early summer. The blossoms remain open only about two hours. Fruits: club-shaped , with a deep umbilicus at the summit, 3.5- 5.5(-8) cm long, 1.5-2 cm in diameter, fleshy, yellow; usually not spiny or only weakly so but completely covered with dense radially arranged yellow glochids. Taxonomic Notes: This species has been described as Grusonia parishii by Pinkava (1999). Crook and Mottram (2001) indicated that the species epithet "parishii" was an orthographic error as it was named jointly after S.B. and W.F. Parish, hence the name should to be corrected to parishiorum. 1) Wikipedia contributors. "Grusonia parishii." Wikipedia, The Free Encyclopedia. Wikipedia, The Free Encyclopedia, 15 Mar. 2015. Web. 15 Mar. 2016. 5) Puente, R. & Baker, M. 2013. Corynopuntia parishiorum. The IUCN Red List of Threatened Species 2013: e.T152673A664152. http://dx.doi.org/10.2305/IUCN.UK.2013-1.RLTS.T152673A664152.en. Downloaded on 15 March 2016. Cultivation and Propagation: Grusonia parishii is a a much decorative hardy cactus seldom found in cultivation. It is a summer grower species that offers no cultivation difficulties. Its cylindrical densely spiny joints provide a striking accent for an otherwise dormant cactus garden. 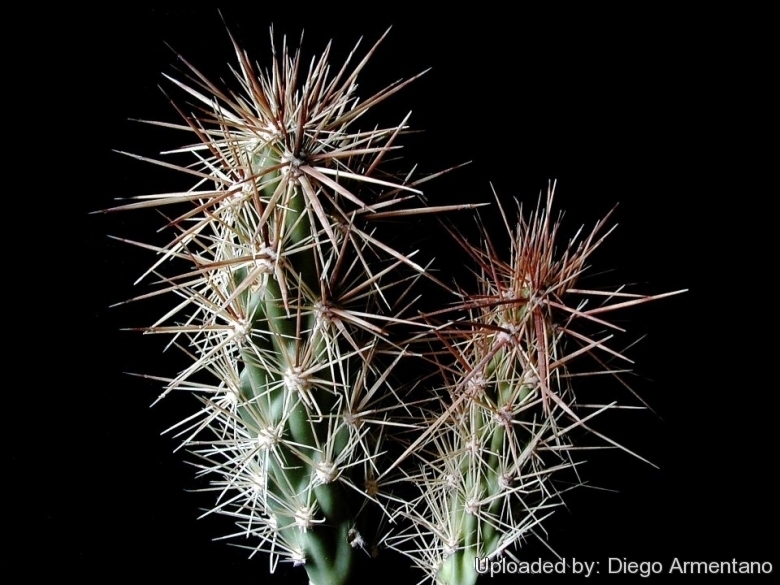 Hardiness: It is a quite frost resistant cactus, hardy to -7° C if very dry. However in cultivation it is better not to expose it to temperatures lower than -0° C, even if in an aerated and protected location, in order to avoid the formation of anti-aesthetic spots on the epidermis. In presence of high atmospheric humidity avoid any frost as it is particularly sensitive to root rot. It can handle extremely high temperatures in summer. Propagation: Stem division. Prickly pear pads root easily and grow rapidly when placed in loose, well-draining soil.